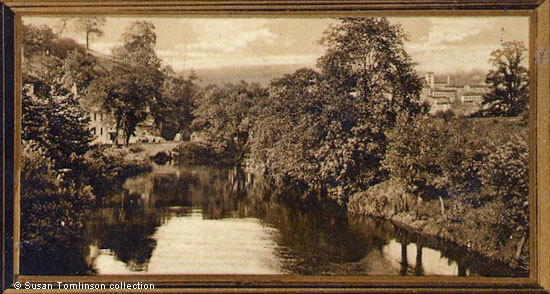 Matlock and Matlock Bath Images: Matlock: Dale Road, Boat House Hotel and River, about 1908. With Licensees. Matlock: Dale Road, Boat House Hotel & River, about 1908. With Licensees. 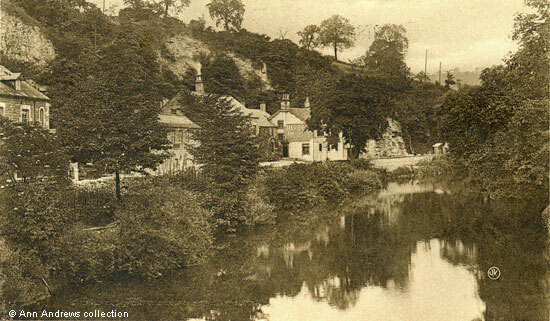 The Boat House Hotel has stood on Dale Road, at the north entrance to Matlock Dale, for over two centuries. Ebenezer Rhodes, visiting in the early 1820s, wrote that "near the Boat House, the first fine scenery of Matlock Dale is presented". Eighty years later J. B. Firth, who was writing at approximately the same time as the pictures for these two postcards were taken, was less complimentary about its surroundings. On entering the the dale "the first thing we pass is a large, unsightly quarry on the right ; then we reach the Boat House Hotel, once one of the fashionable houses of the dale". The former Hotel is pictured here just over a hundred years ago, when Holt Quarry behind had not been quite so extensively worked. 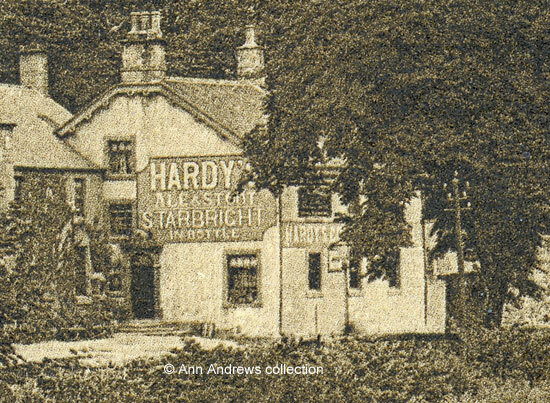 There is an extremely large and unmissable painted sign on the side of the building in the top image, which is enlarged on the left, advertising "Hardy's Ale & Stout, Starbright, Sold in bottle". Unusually, the main entrance is at the side of the building, probably because the property was built next to the road. The front door has changed since that time and there has been a porch for many years, whereas in this view we see that the top of the door surround reached the first floor window. Matlock held an annual May Day Parade at this time and a committee of the Society met at the Boat House, both to assess how the previous year's event had gone and to decide on what they would do. Matlock Football Club held its AGM here in 1912; its season had been disastrous from the playing point of view. Other groups would have met there too, but their meetings weren't mentioned in the press. The image below shows not only the Boat House but also a view of Matlock Bank. Look carefully at the quarry entrance just past the Boat House. A large wheelbarrow is standing end down and with the handles pointing skywards. Sale of property and furniture, 1837. 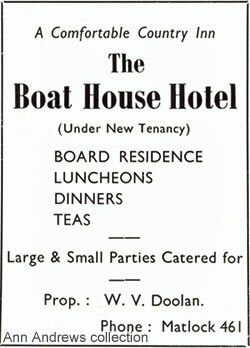 Wardley, Mrs. & Mrs. Harry Boat House Hotel, Matlock Eight years as "host and hostess" up to Dec 1953. Wright, Mr. J. Boat House, Matlock Dale Arthur Jewitt's "The Matlock Companion...", 1835. 1 and 2. "On the Derwent, Matlock" published by Valentine's Series. Printed in Great Britain. Message - a New Year Greeting. Edward VIII stamp. Postcard in the collection of and provided by and © Ann Andrews. 3. "Matlock Bridge". West End Series, published by A. E. Shaw, Blackburn. Posted Whittington Moor, Cheshire on 8 Sept 1908. "Sheffield Daily Telegraph", 28 February 1907. "Derby Daily Telegraph", 30 August 1912.